This blog is dedicated to book reviews posted by Author M.G. Edwards. He reviews fiction and nonfiction in many genres. Michael Eging has written a gem – or should I say treasure? -- of a story filled with adventure and fantasy not unlike tales of yore from some of the greats. A hearty band of elves led by Vondrall must confront the dangers lurking in the bowels of Thunderer Mountain to fulfill their king’s ill-advised promise to bring back a treasured gift. To achieve their quest, they must defeat the dragon whose only vulnerability lies in its name and stave off greedy rivals from the human realm. Can Vondrall and his band claim the dragon’s treasure and live to tell about it? The answer to this secret lies in the pages of Eging’s epic short story. I very much enjoyed this short read. The story is rich in imagery and has a fair bit of humor. It’s a legend that would fit in well into his forthcoming “Song of Roland” fantasy series. It kindled my interest in reading more from the Lost Horizon and tales of Thunderer. I give this story five stars and recommend it to anyone who enjoys reading fantasy. Having recently arrived in Singapore and looking to read some of the best local writing, I was rewarded when I read this gem of a short story anthology. The Malay word for “mixture,” “Rojak” is an apt title for this collection of short, easy-to-read stories that take the reader around the world and leaves them with exotic tastes to savor and provoking thoughts to ponder. It is indeed the “perfect mix of short stories for the adventurous and the armchair traveler” with tales from Singapore to Mexico, England, South Africa, and elsewhere. There’s something for everyone in this book. The anthology is well written and edited. Some stories are concise with clear endings while others end leaving the reader craving more. All pack a strong punch, filled with emotion and depth in mere pages. Many could serve as the basis of full-length novels. Although written by 19 authors with diverse writing styles and interests, the book features a coherent narrative and themes guided by the deft hand of Singapore Writers’ Group founder Alice Clark-Platts, who brought an eclectic “mixture” of members together to write this anthology. I’m looking forward to reading more short stories from the Singapore Writers’ Group and follow-on works by the book’s contributors. Read this book for a taste of what this talented group has to offer, and if you are in Singapore, get to know the SWG. It has a bright future on the Singapore literary scene. I give “Rojak” five (5) stars and recommend it to anyone interested in Singapore, travel stories, or well-written short stories. 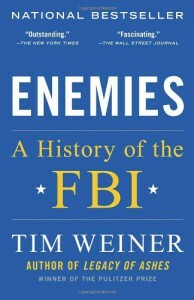 “Enemies” is a colorful tale of the Federal Bureau of Investigation from its humble beginnings in 1908 fighting organized crime to its recent involvement in the War on Terror. Based on a wealth of research, declassified documents and interviews, the book devotes many of its pages to the larger-than-life character of its first director, J. Edgar Hoover, who for half a century personified the FBI and left an indelible stamp on the agency housed in the Hoover Building in Washington, D.C. I was compelled to read this book after watching a biopic on Hoover in order to get a fuller picture of the legendary man. The book offers an in-depth, no-holds-barred look at the Bureau and its leadership from Hoover to its most recent director, James B. Comey. Effusive in his praise and sharp in his criticism, the author paints a picture of a government agency torn between balancing its mission to provide security and fight criminal and terrorist activity and the need to protect civil liberties so that “Americans could be both safe and free.” Its first century has been one of successes, failures, and a constant struggle to find or upset this balance. The author draws from a wealth of documentary evidence to portray a Bureau that in many ways operates like a tragicomedy as it tries to make sense of and respond to ever-changing threats, often in heavy-handed and arguably unconstitutional ways. Weiner does an apt job of bringing the FBI to life. Although the author makes no attempt to tell an impartial story, his interpretation of history makes it all the more interesting. Putting the FBI through the lens of constitutionality and civil rights, he chides the Bureau for its many deficiencies but commends it where it has taken strides to improve, such as discontinuing (at least publicly) warrantless searches and seizures and improving its information systems. He leaves the reader with the impression that the organization has moved away from many mistakes of the past and has a promising future as the U.S. Government’s primary law enforcement agency. The book’s Achilles heel is its over-reliance on archival information. Much of it is devoted to the Hoover years, while events after his death seem glossed over. Depictions of evolution of the FBI during the War on Terror seem rushed. The author felt it necessary to tell the Bureau’s full history, but his lack of source material and apparent lack of access in the post-Hoover period is evident. It might have been better to focus on the agency’s first 50 years and save the last half century for another book. I give this book five (5) stars and highly recommend it to anyone interested in the FBI, federal law enforcement, and civil liberties. This short but fascinating photo travelogue by the husband-and-wife team of Mike and Jo Coad is one of many they’ve produced. 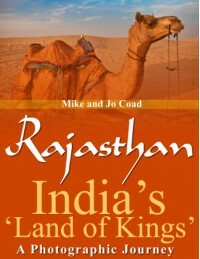 The book is an entertaining, visual look at Rajasthan (literally “Land of Kings”), India’s largest state not far from New Delhi. It offers commentary and stunning photos of Rajasthan’s best tourist destinations, including Jaipur. I’ve visited many places around the world but have yet to visit Rajasthan. This photographic journey gave me ample taste of what to expect. I suspect that the authors’ other travelogues offer similar adventures off the beaten path. Though short, their travel journal features beautiful color photos and enlightening personal commentary to help would-be visitors prepare for their own trips. Publishing a short book with material often featured on blogs offers an interesting take on travel writing. While a novel concept, it faces the same challenges that all travelogues do; that is, a lot of travel information and photos are available online for free. It’s a crowded market. The Coad’s book offers some great information for the would-be traveler or armchair tourist, but it does not cover enough new ground to merit a substantial investment. Virtually everything in this travelogue can be found elsewhere for a pittance. Their travelogue may be worth a pretty penny for those planning a trip to one of their featured destinations, want to know what to visit, see, and do there, and/or want to live vicariously through the Coads. Their photography is also worth a look. This photographic journal – and perhaps all of the Coad’s travelogues – merit four (4) stars for excellent photos and content. This rating is tempered by the reality that free information about places like Rajasthan is readily available online. Their travelogues may be ideal for those planning trips who want to read more personal accounts of their destinations. Many of life’s lessons are packed into this powerful book. 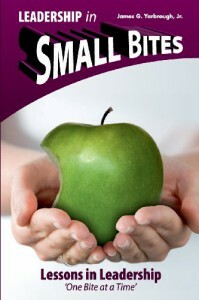 Filled with stories, anecdotes and quotes, Small Bites invites the reader to enjoy – no, savor – the author’s wisdom in “small bites.” Broken into discreet chapters and themes, it offers a series of short stories with lessons learned, acronyms, and structured outlines to help the reader remember salient points, and page breaks to give them time to jot down their own thoughts. At its heart, this is a management book for life. But it’s more than that. It’s a guide intended to help the discerning reader find an easier path on the road of life. Light on spirituality but heavy on profundity, the book weaves the strands of wisdom from many ancient and modern philosophies into a beautiful tapestry of poetry and prose. Few books quote Gandhi, Michael Josephson, Mark Twain, John Wooden, and others with such eloquence. I enjoyed the personal stories that the author shared showing his humanity and his quest to rise above the challenges that made him a better person. Not many writers are so willing to share some of the most difficult – and compromising – moments of their lives with an unknown audience, but Yarbrough did. And he did it with class, using his own lessons learned to demonstrate a better way the reader can follow. The author wrote this book for his three children. It’s a labor of love they can cherish forever. He could have kept this treasure to himself or in the family, but he chose instead to share it with all of us. I appreciate his sincerity and learned at least one take-away in each chapter applicable to my own life. This is the kind of book you don’t read once; you read it over and over again to glean new insights. If I have any quibble about this wonderful book, it is this – I hope that the author’s next book will expound more on his own great quotes. I give Small Bites five (5) stars and highly recommend it to anyone with an open mind, a willingness to learn, and who enjoys wisdom in small, succinct bites. To say that this book has heart is an understatement. Nineteen veterans who served in Vietnam between 1965 and 1972 poured their personal stories on the page to tell those of us who never experienced the Vietnam War what it’s been like to fight it for more than 40 years – first in ‘Nam and then at home. One cannot read this book without being touched by the veterans’ unforgettable tales of devastation and facing unspeakable horrors that few ever experience. Their thoughts, emotions, and insights are laid bare for all of us to read. Because of the bitter divisiveness and controversy of the war (not a conflict) and the trauma inflicted on those who survived Vietnam and returned home to a frigid reception, their stories too long were untold. No longer. These authors’ unvarnished and frank narratives pull no punches in the faces of the faint of heart, the easily offended, or those who treated the Vietnam veterans with contempt. Regardless of one’s view of the Vietnam War, these accounts are critical to understanding what really happened and how those involved were affected. One must remember and learn from a war that many wanted to forget so that the past is never repeated. These soldiers’ stories help preserve the legacy of the war, from the Band of Brothers to the Agent Orange and anti-war protests. Whether one agrees with what has been written is not as important as reading the book to understand the fall out of a conflict in Vietnam and at home that, in some ways, is still being fought by those who remain. The book is written from the unique perspectives of veterans who served in different branches of the U.S. Military across South Vietnam at the height of the war. If you’re the child or descendant of a Vietnam veteran and want to know but are afraid to ask why they won’t or can’t talk about the war, read this book. It may be the closest you’ll get to talking about Vietnam with your own parent or grandparent. As the son of a Vietnam veteran, I am proud of these veterans for having the courage to share stories that they have held inside for decades. I give this book five (5) stars and highly recommend it to active military, veterans, their families, and anyone interested in the learning more about the Vietnam War. As a fan of Khaled Hosseini’s books, I jumped at the chance to read his latest novel. The author once again delivered a gem of a book with vignettes woven into a complex tapestry of the nation and culture that is Afghanistan. Hosseini has arguably done more than any other author redefining contemporary Afghanistan beyond the caricature of a tragic, war-torn mess. His previous bestsellers, The Kite Runner and A Thousand Splendid Suns, paint a colorful portrait of a haunting land misunderstood by many. His latest is a departure from his tried-and-true formula of writing epic stories that bring to life the rich culture and heritage of the Afghan people. Set in far-flung locales from California to France and Greece, And the Mountains Echoed takes readers to new places and realities. Although the author tried to depict life in the United States and Europe, he merely whetted my appetite to read more about Afghanistan. His homeland is where his pen spills mastery onto the page. Hosseini detoured from his almost-mythical stories of Afghans who persevered under the most difficult of circumstances toward the frailty and flaws of human nature. And the Mountains Echoed offers more shades of gray than its predecessors. The moral hazards and ambiguity in his characters come to life in fateful decisions that lead to pay-off or penance as their choices affect others whose lives they touch…and their own. The morality tale the author spins may leave readers used to rooting for his typically heroic figures wanting. Those expecting this book to be another Afghan epic may be disappointed. I laud Hosseini for departing from his previous works and breaking new ground. Though I wished at times while reading the book that it was more like what he is best known for, I appreciated his determination to write something different. It adds to his standing as one of today’s best writers of historical fiction. If you’re a fan of his books, you can’t go wrong once you understand that this novel is different from the rest. I give And the Mountains Echoed four stars and recommend it to anyone who enjoys historical fiction. Therein lies the weakness in the new “Sand” series – it feels rushed and reads like a vague retelling of the author’s other works. The “Sand Omnibus” comes off as an above-surface version of the silo world introduced in Wool. Although the “Sand” series has some notable distinctions from the “Silo Saga,” the similarities are too obvious to ignore. Both are set in post-apocalyptic versions of what was once the United States, featuring a changed environment created long ago by self-destructive ancestors. Ageless technology from a bygone era keeps survivors alive in hostile landscapes. Both series feature several protagonists’ points of view that jump from character to character as the storyline progresses. The reality of both worlds shatters when two worlds collide. What was new and refreshing in the “Silo Saga” leaves the reader with a “Sand” aftertaste like grit in one’s teeth. The omnibus does break some new ground for Howey. His imaginative, “Max Max”-style take on how people adapt to living on the surface and sand diving in a desert world is fuel for the imagination. He delves deeper into human relationships as told through a dysfunctional family almost torn apart by the sands of time. The author’s portrayal of love, loyalty, and camaraderie among family and friends is uneven but a gripping story. His depictions of humans using vibrating dive suits to move through sand like water seems unique in literature, as are other adaptive technologies harnessed by post-apocalyptic humanity. Although the “Sand Omnibus” is well written, its storyline and pace suggests that the author should have slowed down and spent more time tightening the plot to avoid questionable coincidences and tidy conclusions. Had the series not been published in the aftermath of the ground-breaking “Silo Saga,” it might have elicited a better response. I give the book four stars and recommend it to anyone who enjoys dystopian science fiction. Originally published by John W. Campbell as a novella in the August 1938 edition of the magazine Astounding Science-Fiction under the pen name Don A. Stuart, “Who Goes There?” spawned the body horror fiction subgenre and three versions of the movie The Thing. The plot is familiar to millions of fans of the 1982 John Carpenter film. Campbell pioneered the concept of an alien creature that invades and assimilates human hosts and then kills them as it jumps from host to host. The story’s theme has been replicated in dozens of movies and books from horror classics like The Blob and The Fly to zombie apocalypses. “Who Goes There?” is arguably the granddaddy of them all. Campbell’s story is timeless. Its narrative is filled with scientific theories and observations about human behaviors still valid eight decades later. Some of the technology and language he used is dated, but much of the plot is relevant and has been retold in other tales of horror both modern and classic. The ending in this story is different from what The Thing movie fans would expect, but the characters like the pilot, MacReady, are all too familiar. “Who Goes There?” deserves five stars and is a must-read for anyone who enjoys science fiction, horror, and contemporary classic literature. Author Nir Eyal synthesized and dispensed some of the best work from his website into this great book on consumer behavior and building products that encourage their usage. Organized into chapters that break down basic human habits and responses in a theoretical way, it offers concrete examples of organizations that are now among the most successful at building habit-forming products. Its Hook Model is an easy-to-understand method for applying complex concepts related to human behavior and responses to business applications. Although focused largely on the technology sector, the ideas the author presents are applicable to any company or individual looking to build something better. Mr. Eyal’s book itself is a habit-forming product. He leaves the reader with a memorable model that they can use in their own businesses and encourages them to return to his website for more insights. Not many theory books take applicability to the level Mr. Eyal’s does. I appreciated his sincere caution that the Hook Model be used for positive ends and acknowledgement that it can be used to foster addictions. This relatively short book is a great road map that points the reader in the right direction to build great products but may not go far enough for some. It will also be dated in a year or two when today’s “hot” companies become passé. Nevertheless, his theories on human behavior may well prove timeless. I give the book five stars and highly recommend it to anyone looking to design better content, goods, or services. The title of Caterina Christakos’ short guide sold me on it, but a short read later left me wondering if I should have picked a different book. It’s very short – perhaps ten pages. While packed with information, it does not offer many new tips or suggestions for authors who have already published one or more books. The guide offers some money-saving advice that could prove valuable but is generally available elsewhere. It does not go far enough in giving the reader value for their money by offering more options. In the audio books section, for example, it did not make reference to Audible.com, Amazon’s audio bookseller, or producing an audiobook using Amazon’s ACX. Perhaps this was an oversight or the guide needs to be updated. 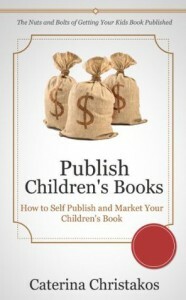 Although advertised as a resource for publishing children’s books, the guide is applicable to writers of many genres. This is a plus in that you don’t have to be a children’s writer to get something out of it. On the other hand, a children’s writer may not find Ms. Christakos’ guide useful enough to make it worth buying. There are other, better reference materials on publishing children’s books, including free options such as newsletters and publishing guides for writers that provide more in-depth information. If you are a beginning author who needs some general information to get started, this might be the book for you if it’s reasonably priced. If not, take a pass and check out other resources. Zoe the Zebra Now on Sale! 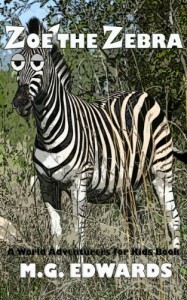 Check out my new children's book, "Zoe the Zebra"! The third book in the World Adventurers for Kids Series, “Zoe the Zebra” is an illustrated picture book that teaches children about bullying. A young zebra named Zoe who lives in the African bush joins forces with her friends Emma the Impala, Barry the Baboon, and other animals to protect their friend Wally the Warthog from a pack of bullying hyenas. Can they help him and stop the bullying? Inspired by the author’s safari adventures in Africa, the story features Zoe and a host of safari animals, including giraffes, hippos, and lions. Fun for kids and adults alike, the story will take children to the African plains and teach them how to handle bullies. Coming soon to Apple iTunes, Google Play, Sony ReaderStore and other booksellers.